If the Samsung Gear S wasn’t big enough to make a statement by itself, the collaboration with Diesel just fixed that problem for you. Diesel Black Gold, which is the premium line of the Diesel fashion label, has made a host of accessories, that turn the Gear S watch into wrist-born fashion pieces, clad in leather, with a handful of silver studs thrown in for good measure. 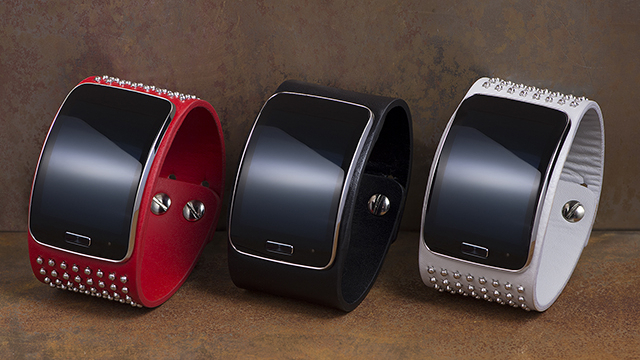 Samsung smartwatches: What Gear should you buy? The bands are certainly big, and while price and availability information is thin at best, there are black, red and white versions available. The bands are certainly an individual look and we can’t see them selling in their thousands, but it’s another statement of intent from Samsung, that it intends to back its watches with high-profile fashion brands. Earlier this month, Samsung announced a Swarovski encrusted Samsung Gear S, that oozed the sort of class associated with Saudi sheiks.. If fashion tech collaborations are your cup of tea, check out our list of the best designer wearables money can buy.